1. What is Lace Front Wig and Full Lace Wig? Full Lace Wig: "Full Lace Wigs" are lace wigs which are designed with the entire wig cap being made from lace as well as lace all around the perimeter of the wig. 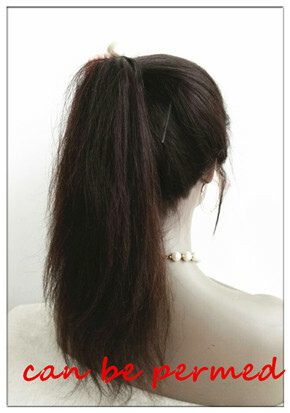 Full lace wigs do not allow you to wear your hair in high up dos and ponytails. Upon applying & adhering the lace wig, a flawless, natural and undetectable hairline is created. 2. What are Bleached Knots and what is silk top ? 3. What does Density refer to? 4. How long I can expect the wig to last? 5. Will the hairline on the lace wig have a natural look? 6. Do you charge extra for Baby Hair? Does the wig come with Baby Hair? 7. Does the straight hair wave up when being wet? 8. What is Yaki Texture and what is the difference between Yaki and Silky? 9. What is the difference between Full Lace Cap with Stretch and Full Lace Cap without Stretch? 10. What is the difference between Swiss lace & French lace? 11. Do I have to wear a wig cap with the wig? 12. Is the wig available for being parted as I wish? Yes, all our lace wigs can be parted anywhere, this is free styled. Our wigs are all freestyle. 13. 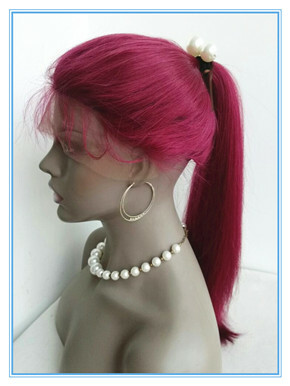 Can I wear my lace wig in a high ponytail? 14. What kind of Glue or tape should I choose? 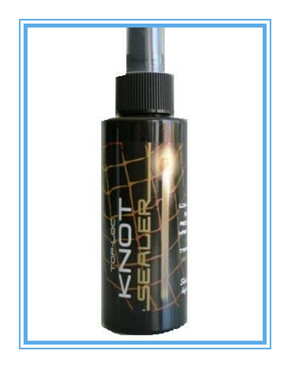 If you want a 1-6 week hold,you will want to purchase the Ultra Hold glue or the Safe Grip Wig Glue.For a 1-10 day hold the Mity Tite is best. Some prefer the ease of rolling on tape adhesive.Or use glue in the front hair line and tape in the back. 15. Will the glues and tapes break my skin out? 16. I have sensitive skin, which glue should I use? 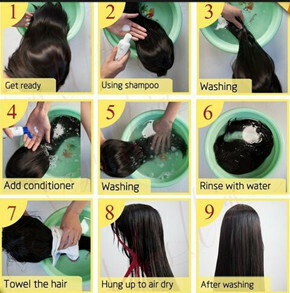 17.How to wash your wig? 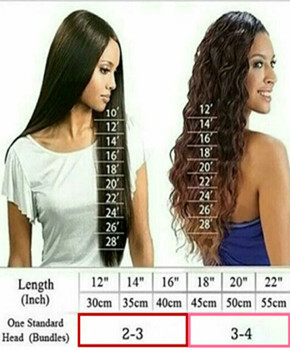 18.How to measure the hair length? 19.How to handle curly wig? 1. Understand that curly hair is exotic, classy, striking, and most of all, unique. 2. Don’t wash curly with a sulfate shampoo and try to find a conditioner without any silicones. 3. Don’t touch your hair while it dries! This will only lead to fly aways and frizz! 4. Brushing can damage fragile curls. Opt for finger-combing or a wide-toothed comb instead. 5. Use a satin pillow to stop your hair from tangling too much at night. 20.How often should I wash my wig? This can vary a lot from person to person, and can change seasonally as a hot humid weather and cool dry weather will make things very different. In generally most people wash their wigs about once every 10-20 days. Again this depends on how long the wig is used, the climate and whether it was exposed to things like smoke. If you wear wigs every day, its best to have a backup wig or a small rotation of your favorite styles. This gives each individual wig less wear and also ensures you have something to wear if something doesn't go as planned with washing or restyling. 21.How to style your hair? 1) Your wig comes pre-styled with a basic style, but we encourage our clients to have their wigs customized by a professional hair stylist. This is a great way to make the wig uniquely your own. Often, a little trim on the bangs and a little thinning here or there can make all the difference in the world. The wig should be cut while you are wearing it. Everyone has a different face shape, a different forehead length, and different style preferences. Seek out the assistance of experienced professional, and only allow the wig to be cut while it is on your head. 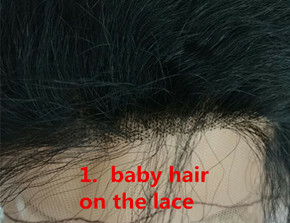 2) Your lace wig bought from Beahairs is made by 100% human hair can all be used on low heat settings on human hair wigs. You can choose to perm the wig as you wish. However, we cannot give any suggestions how you can perm the wig. You shall choose the procedure you learned to style the hair. 22.How to put on a wig? Wigs should be worn on the natural hairline (for most people it is four finger-widths above the eyebrow). Remove wig from the plastic bag or box. Gently remove the protective hair net from your wig. Give your wig a few good shakes to the hair body. Some wigs need to be shaken to release the preset styling. Brush your hair off your face at the top and sides. If your hair is too long, you may want use bobby pins to help keep it off your face, back at the sides, and up at the nape. Some women use a wig liner or wig cap to keep their existing hair in place. Hold your wig at the sides with the woven label in back. Place it at your natural hairline and slide it on from front to back. Adjust the wig as needed so the front edge is just over your natural hairline. 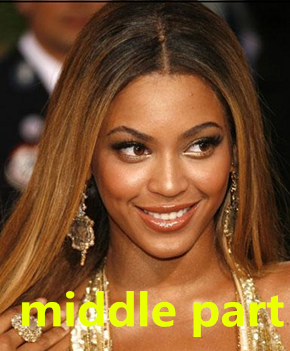 Use the ear tabs to center your wig from left to right. Adjust the straps in the back if necessary for a more secure fit.Tuck in any stray hairs at the front, sides and nape. Now you're ready for styling! 23.How to prevent wig shedding and tangle? but after wash and nurse many time will be ok.
so the ends will feel dry,suggest nurse the goods as our own hair with oil. 24.which looks more natural and realistic? 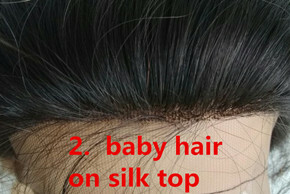 baby hair on lace or baby hair on silk top? 25.What's the difference between machine wefts and hand-tied wefts? Hair extensions are held together with a band of fine threads, these are called wefts. Wefted hair can be machine or hand-tied. Handtied wefts are much thinner than machine made wefts,they will lay flat on the scalp to give a more natural look and significantly reduce hair bumps, but machine made wefts are more durable ,most would love machine wefts since it's much more cheaper! 26.How do I care for my hair extensions? Wash the hair when you shower and make sure it is hanging loose .Use a good quality shampoo and conditioner. Remember that hair extensions don't benefit from the scalp's natural oils like growing hair so make sure it is regularly conditioned. After washing and conditioning, apply a good leave-on spray conditioner to keep it fresh between washes, if it gets wet in the rain apply some more and condition hair after exercise too as the salt in perspiration can be damaging. Always pat excess water from the hair and try and let it try as naturally as possible. Avoid sleeping with wet or damp hair. If you do have to use a blow dryer, dry the hair from the ends up and use one with a diffusing tool. Loosen the hair every morning and before you go to bed. Avoid combing tightly curled styles and shake them out instead. 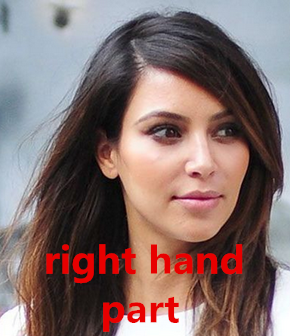 You can use a wide tooth comb or fingers to loosen wavy hair and a comb is fine for straighter hair extensions. How to measure your head? 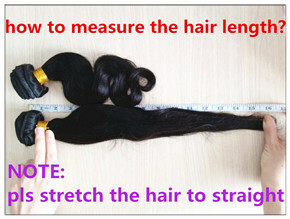 1.The Circumference of the Head:Measure all around the head. Position tape measure so its edge follows the hair line around the head and nape of the neck. 2.From Forehead to Nape of Neck:Measure from hairline at center of forehead straight back over crown to center of hairline at nape of neck. Note: Place the tape measure about 1/2 inch in front of your hairline in the front of forehead while taking the measure to the back of your Nape (neck) about 1/2 inch below your hairline in the back. Keep in mind that your cap is glued to the outside perimeter of your natural hairline on your skin. 3.Ear to Ear Across Front Hairline:At front of ear, measure from hairline at base of sideburn, up across the hair line along forehead to same point in front of other ear. 4.From Ear to Ear Over Top of Head:Measure from hairline directly above the ear across top of head to the hairline directly above the other ear. Burmese hair comes from the country of Burma. The texture of the Burmese hair is well suited for those with coarse natural textured hair. Burmese hair is healthy and extremely resilient. It lasts for a long time. Burmese hair is cross between Chinese and Indian hair and it gives you endless styling options. This hair can be worn it it’s original wavy pattern or straightened for a sleek look and will return to it’s original pattern once washed. Your 100% satisfaction is our greatest motivation and joy!!!!!!!!!!! !